Living in Los Angeles this winter, after two consecutive seasons of “what-ifs,” two consecutive years of watching other teams celebrate on the green grass of Chavez Ravine, two consecutive years of sitting idly by, waiting for the deep-pocketed, second-largest market, mega-TV deal, Dodgers to spend on an impact free agent, has been trying, to say the least. Sure, the Dodgers ponied up an additional $28M to keep “the franchise” in town for an additional year. Sure, they guaranteed A.J. Pollock $60M over four years to patrol center field for those games (how many, TBD) that he is not injured. Sure, the team made a qualifying offer to Yasmani Grandal, who elected to take $325K more to catch for openers in Milwaukee, rather than Kersh, Buehler, Ryu, and Jansen in SoCal. But all we have heard for a few years now is that the Bums were looking to get under the luxury tax threshold so that they could reset the penalty and start spending like drunken sailors when the free agent class of 2018-19 became available. 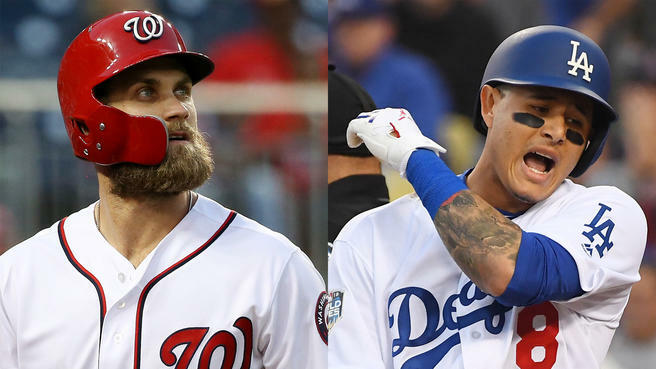 Fans and front offices were salivating over the likes of Kershaw, Kimbrel, Keuchel, Corbin, and, of course, Harper and Machado. But since the Dodgers never intended to let Kershaw get to the open market, he came off the board. And since they signed Jansen to the second-richest relief contract in history, they didn’t have room for Kimbrel. And since they didn’t want or need another left-handed starting pitcher, Keuchel didn’t make much sense. And since Corbin decided to get off the market as quickly as possible, the Dodgers may never have had a chance to make a bid. Which brings us to the two crown jewels. The two 26-year old free agent stars who were looking to set AAV and total compensation records. The two guys who were looking to be locked up for a decade or more. The two guys who the league has been waiting for to reverse two years of moribund free agency. And yet, a funny thing happened on the way to the market – the market changed and their performance waned. It is a truism that players shine in their walk year. I guess these guys didn’t get the memo. Harper decided to hit .239 with a career high in strikeouts and his worst defensive season to date. Machado told the world that hustling is for suckers, and showed the world that other teams’ defenseless infielders were open prey. So when Machado turned a shot off the top of the wall in the World Series into a single, and when Harper more than hinted that ten years was not a long enough contract, the market reacted. Just not in the way that either player or the MLBPA had hoped. According to Chelsea Janes of the Washington Post, the Nationals offered Harper 10/$300M before the hot stove got cooking. There are some who believe that the Nationals made that offer so their fans knew they “tried,” all the while knowing that Harper would pass. And those same people believe Harper’s agent, none other than Scott Boras, leaked the offer to set a floor for future offers. To date, we have heard of none (except, maybe, the Nationals increased their offer). According to Bob Nightengale of the USA Today, the White Sox offered Machado 7/$175K. To you and me, a cool $25M/year is pretty good scratch. For a guy who was expecting $300M and hoping for $400M, the numbers seemed a little underwhelming. And his reps were quick to condemn the reporting, but nothing has happened since, so who knows. Which brings us back to the Dodgers. Should they jump in with both feet and a large checkbook to sign either star? Are either worth the money? If you are the Dodgers, does – should – money even matter? Stan Kasten, in a clumsy interview with the Los Angeles Times seems to think so; but he doesn’t think enough of the average fan to explain why. If you have followed the Dodgers under their new ownership group, and with Andrew Friedman at the helm, you know that signing long-term deals over $100M is anathema to them. You had to see this coming – that the team would be considerably more circumspect about spending upwards of $200 or $300M for either guy. And that was before Machado fell down striking out to end the World Series and Harper turned in a 1.3 bWAR season. So before we castigate the front office for sitting on its hands and having short arms, let’s look at this unemotionally. I am not a huge Corey Seager guy (I tend to think, advanced metrics aside, that he is overrated). But, would you rather have Seager at $4M for 2019 or Machado for $34M (guesstimating)? And keep in mind, Seager has two more years before he is a free agent. Even assuming he gets Mookie Betts-type arbitration money (say, $10M in 2020 and $20M in 2021), you are still $68M ahead of the game going into 2022, without having another seven-ish years of commitment to a player heading into his thirties. A player you have seen up close and know he ain’t the hustling type. And, this analysis is only necessary because Machado insists that he is a shortstop – not a third baseman. This, despite the fact that he is in the conversation for the best defensive third baseman in the entire game (I see you Nolan Arenado and Matt Chapman). Let’s assume Machado gets over himself and agrees to play third base. What do you do with fan-favorite Justin Turner, who is owed $39M over 2019 and 2020? Do Dodgers fans think Machado is $31M better at the hot corner over the next two seasons? And from 2016-2018, Machado laps Turner by a whopping 1.0 bWAR. Still want Machado? Now let’s talk about Harper. The truth is that Harper is good, and may one day become great. But he ain’t “great” today. And it doesn’t matter what Scott Boras includes in his 75-page briefing book, it cannot change the fact that Harper came into the league in 2012 with a 5.2 bWAR, had a 10.0 in his MVP year of 2015, and has never cracked 5.0 in any other season. Is that guy worth $35-$40M per year? Maybe. Is he worth that for 8-10 years? You don’t need to be Harvard-educated (or even Tulane-educated) or a quant to answer that question. So it seems, as per usual, the Dodgers are playing this smartly. They are keeping their powder dry and giving themselves payroll flexibility (insert billionaire joke here) so that they are ready to pounce before the July trade deadline. The Dodgers have gotten a ton of grief for being parsimonious, but to quote Bob Sugar, “it’s not show friends, it’s show business.” And these guys have shown, time and again, they know the business of baseball better than most. Have they made some mistakes, sure. Have they missed some opportunities, of course. But ask yourself this, do the Dodgers want to be spending $35-$40M/year on a 35-year old Bryce Harper in 2027? If you need some help with that one, drive a few miles down I-5 and ask Arte Moreno about paying Albert Pujols the back half of his contract. And before you tell me that Pujols was older when he signed his deal, know that in his age-35 season, Pujols had a 3.0 bWAR and earned $24M (and followed that with seasons of 1.3, -1.8, and 0.5, all while taking home $78M). The Dodgers play the long game – both for the season and for their future. By not overspending in the winter, they can properly spend in the summer. At the 2017 deadline, they grabbed Yu Darvish, Tony Cingrani, and Tony Watson – all helpful pieces on their way to the pennant. Last year they acquired Machado and Brian Dozier – great and needed additions. People revere the Patriots for thinking long-term and building for sustained success. The Dodgers front office deserves the same benefit of the doubt. Relax Blue Nation, patience is indeed a virtue.